Israeli soldiers, on Saturday evening, assaulted Palestinian medics while they were attempting to reach the wounded in a traffic accident which occurred outside the illegal settlement of Gush Etzion, to the south of Bethlehem, in the occupied West Bank, according to the Palestinian Red Crescent (PRC). 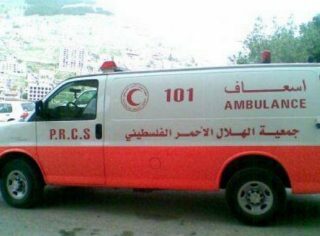 Director of PRC in Bethlehem, Mohammad Awad, said PRC staff were attempting to reach the accident to help the wounded, but Israeli soldiers and policemen who were present at the scene prevented them from reaching the wounded. A wrangle later developed between the soldiers and the medics who sought to provide first aid to the injured of the accident, before the soldiers assaulted one of the PRC medics, Jamal Balboul, and reportedly beat him, according to WAFA.